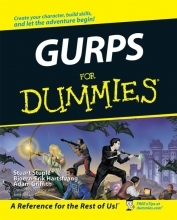 Co-authors: Adam, Hartsfvang, Bjoern?Erik, Stuple, Stuart J.
GURPS For Dummies helps you create more detailed, exciting, and interesting characters and take your game to the next level. That?s important whether you?re saving a princess or saving the planet?searching for hidden treasure or for secrets to eliminate disease? fighting crime or combating armies of evil robots?casting spells in medieval castles or destroying terrorist cells in modern day milieus. With GURPS, the only limitation is your imagination. An estimated 6 million people play GURPS (Generic Universal Role Playing System), and its creator, Steven Jackson Games, has sold more than 1. 5 million GURPS Basic sets. Written in partnership with Steven Jackson Games, this insider's guide shows newcomers to GURPS, Fourth Edition how to build a dynamic character and succeed in game play. GURPS (Generic Universal Role Playing System) is not like other role playing games because it gives you the freedom to create any world or character you can imagine. This fun and easy guide gets you up to speed, so you can get into the game and hold your own right from the start. Part I: Getting Started with GURPS. Chapter 1: Introducing GURPS?The Generic Universal RolePlaying System. Chapter 2:? Determining Your Role. Chapter 3: Laying the Attribute Foundation. Chapter 5:? Finding Your Hero's Flaws. Chapter 6:? Finalizing Your Character with Skills. Chapter 7: So You Want to Be a Wizard ? Magic. Chapter 8: Powering Your Character. Chapter 9: Tackling Tech Level. Chapter 10: Playing Races Outside the Norm. Part III: Playing with Your Character. Chapter 11: Doing Unto Others: Combat. Chapter 12: Tracking the Details. Chapter 13: Playing the Role. Part IV: Running Your Own Adventure. Chapter 14: Playing the GM. Chapter 15: Building a Simple Adventure. Part V: Building Your Own World. Chapter 17: Creating a Complete Campaign. Chapter 18: Setting the State for Your World. Chapter 19: Mapping, Planning, and Plotting. Chapter 20: Creating Memorable NPCs. Chapter 21: Flavoring your Campaign. Part VI: The Parts of Ten. Chapter 22: Ten Rules for Spending Points. Chapter 23: Ten Advantages We Like. Chapter 24: Ten Disadvantages That Aren't Too Painful. Adam Griffith is a 28?year gaming veteran skilled in creating characters and campaigns. Bjoern?Erik Hartsfvang has 24 years of experience crafting and running game worlds. Stuart J. Stuple has 15 years of gaming experience with a focus on technology and alien races. Chapter 1: Introducing GURPS The Generic Universal RolePlaying System. Chapter 2: Determining Your Role. Chapter 5: Finding Your Hero s Flaws. Chapter 6: Finalizing Your Character with Skills. Part II: Enhancing Your Character. Chapter 7: So You Want to Be a Wizard Magic. Chapter 24: Ten Disadvantages That Aren t Too Painful.